Bluesky has an extensive data library that covers 150,000 sq km of off-the-shelf aerial photography. 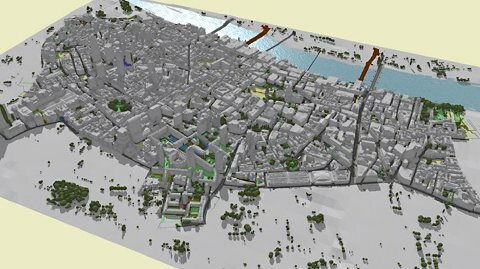 With access to this resource CyberCity 3D will have gain access to urban centers across the UK immediately for 3D Smart Building production. Bluesky’s specialization in the acquisition and processing of aerial photography will benefit CyberCity 3D as it finds the need for “new” flights to produce 3D models for its increasing client base.Earlier this year, CyberCity 3D – utilizing Vertex imagery – completed production of 3D London City Centre as well as an extended area including Nine Elms, South Kensington, and Chelsea. The resulting 3D model has attained acclaim and client interest, and led to this groundbreaking new agreement with Bluesky. By the end of the summer, this data partnership is expected to grow into a 3D data sales agreement involving maps throughout Great Britain.CyberCity 3D will be able to offer precision 3D smart buildings in Great Britain and provide clients with 3D city modeling. The company expects to launch cloud-based 3D buildings services this summer. Bluesky recently unveiled a detailed digital map of tree canopy cover in an area of approximately 150,000 square kilometers and including more than 300 million trees. Via CyberCity 3D, this National Tree Map is scheduled to be integrated into Esri CityEngine 3D scenes built in partnership with Esri UK and Cumbria based Garsdale Design Ltd. This entry was posted on Thursday, June 5th, 2014 at 1:00 pm. You can follow any responses to this entry through the RSS 2.0 feed. You can leave a response, or trackback from your own site.